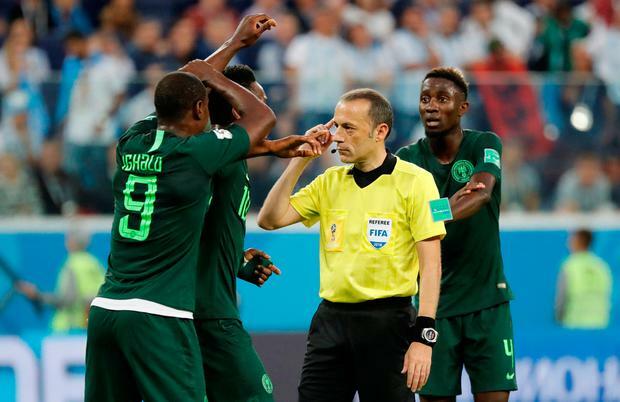 Nigeria's Odion Ighalo, John Obi Mikel and Wilfred Ndidi appeal to referee Cuneyt Cakir before referral to VAR. FIFA refereeing bosses celebrated what they described as a scandal-free World Cup for match officials on Friday, saying that the video replay system had helped achieve an accuracy rate of 99.3 percent for decisions in the group stage. "After 48 games, we haven't had a single scandal, and that's very important," FIFA's director of refereeing, Massimo Busacca, told reporters. Pierluigi Collina, head of FIFA's referee committee, said that 95 per cent of the decisions taken initially by referees had been correct, and this had been raised to 99.3 percent thanks to the intervention of VAR. He said that 335 decisions had been checked in the 48 group stage matches and there had been 17 VAR reviews -- 14 on the field and three by the VAR assistants. However, the Italian former World Cup referee would not comment on individual decisions, such as failure to award Serbia a penalty against Switerland when Aleksandar Mitrovic appeared to be held down by a defender. "I think that 99.3 percent (accuracy) is an acceptable figure after these 48 matches."